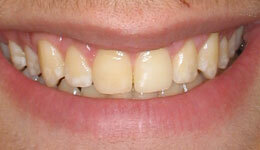 Normal brushing and flossing can help maintain a healthy and clean smile, but you may notice some discoloration. Over time, it is normal for your teeth to become discolored or stained due to the food or drinks we consume, even with proper oral hygiene and care. 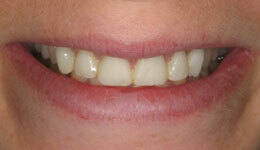 Many people are interested in having a whiter smile but are unsure which option is best for them. Your smile plays an important role in your confidence. 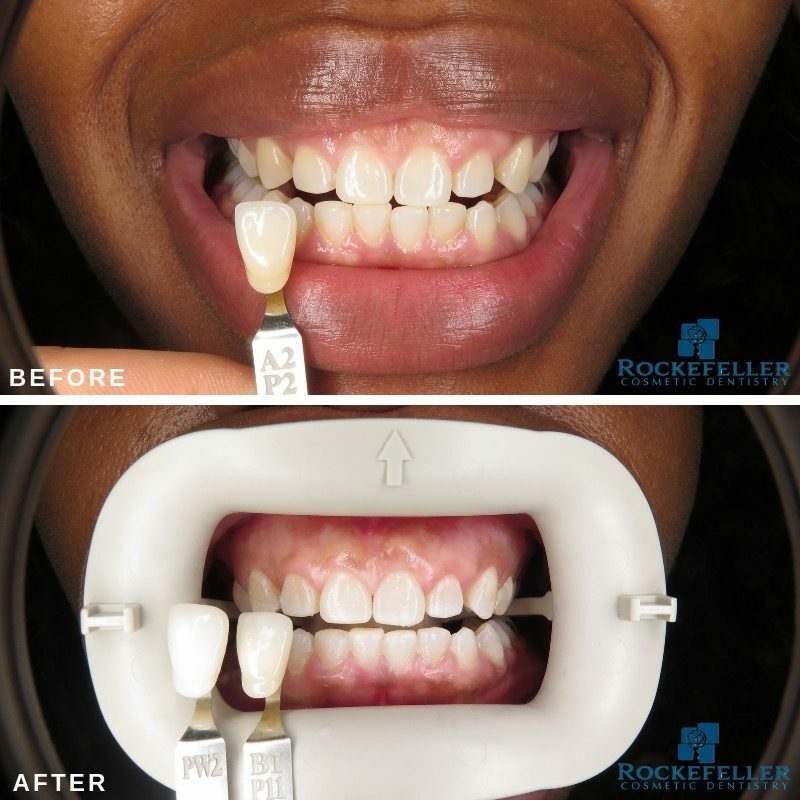 Let us guide you through our options to whiten your smile. Teeth whitening, also known as bleaching, is a simple, non-invasive dental treatment used to change the color of natural tooth enamel. This is a simple technique to remove stubborn stains from your teeth and brighten your smile. 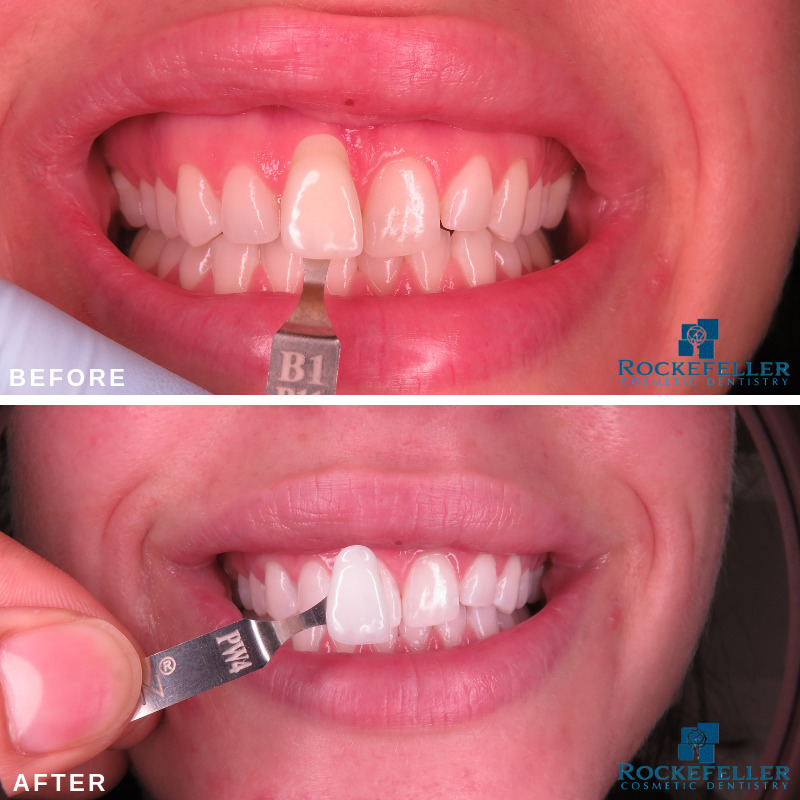 Here at Rockefeller Cosmetic Dentistry, we provide our patients with two options for teeth whitening: in-office bleach and at-home bleaching kits. Both options provide amazing results and are guided by our elite specialists. Our in-office bleaching technique normally requires one office visit to complete. Before the whitening procedure begins, the dentist will examine your teeth to ensure there is no decay or gum recession present. If there is decay or gum recession present, the whitening process may make your teeth sensitive. 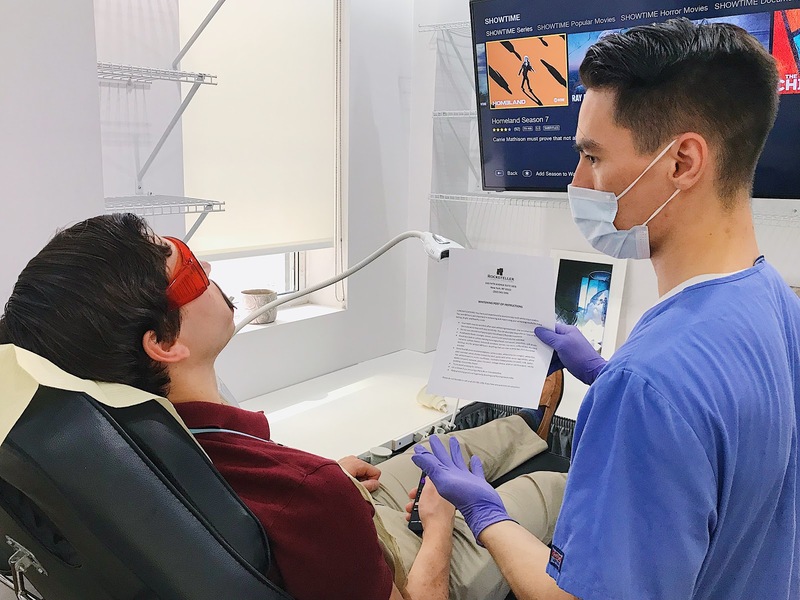 Once the examination is complete, the dentist will thoroughly clean your mouth out of any bacteria, food, and plaque that build-up on or between your teeth. Now that the teeth are prepared for the whitening process, the next step requires applying a protective layer on your gums to prevent the whitening gel from harming your gums. The whitening gel is then applied to the enamel of your teeth. The whitening gel contains some form of hydrogen peroxide that gently bleaches but does not harm the tooth. Once the gel is applied all that is left to do is sit back, relax, and enjoy a television show or movie of your choosing. 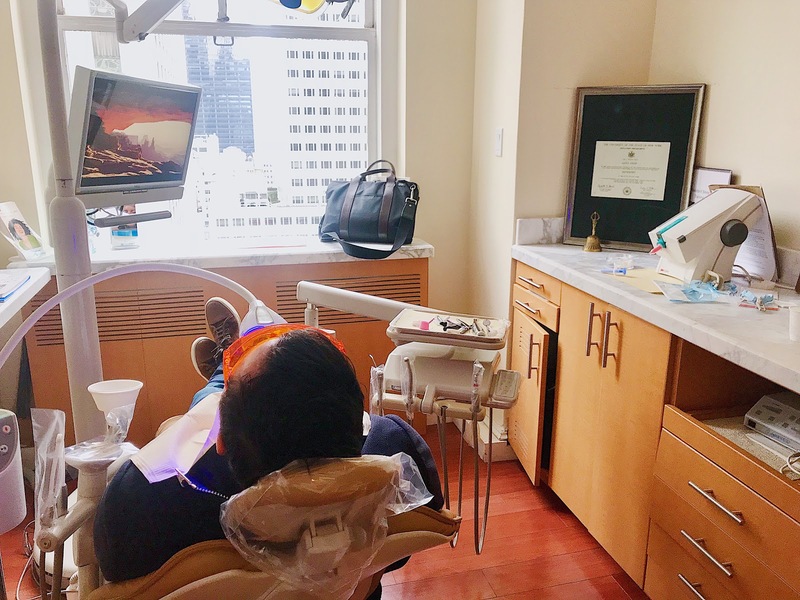 Our at-home bleaching kits provide our patients with the option to brighten their smile in the comfort of their own home. The patient will come into the office to have impressions taken of their teeth. With these impressions. the dental technician will then fabricate custom, plastic trays from the molds. The dentist will make sure your trays fit perfectly in your mouth prior to moving forward, to ensure a safe and comfortable outcome. 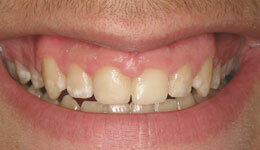 If the trays do not fit properly, it could irritate or even damage your gums. Next, the dentist will give you detailed instructions on how to place the whitening gel in the trays. The trays are to be worn everyday or overnight until you have reached your desired color. It is normal to experience some tooth sensitivity during the time the trays are in your mouth and should go away once you have stopped bleaching. Discoloration. Tooth discoloration can be caused by a number of reasons, such as plaque, oral health concerns or stains from pigmented foods and beverages. 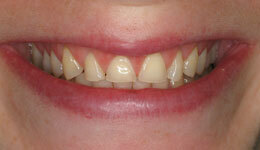 Discoloration can result in an unsightly smile and teeth whitening is the perfect solution. Reduce the effects of aging. As you age, your tooth enamel will begin to wear down making it easier for tooth discoloration or oral health complications to occur. They can begin to look dull and unhealthy. Fluorosis. This is excessive fluoridation during tooth development. It causes teeth to appear with stains ranging from yellow to brown. Fast and easy results. Both in-office and at-home whitening kits are quick and easy. Our specialists will help you every step of the way to ensure a bright new smile.